SC 45TW | Adjustable Speed Tank Cleaner - Scanjet SC 45TW | Tank Cleaning Technologies, Inc. 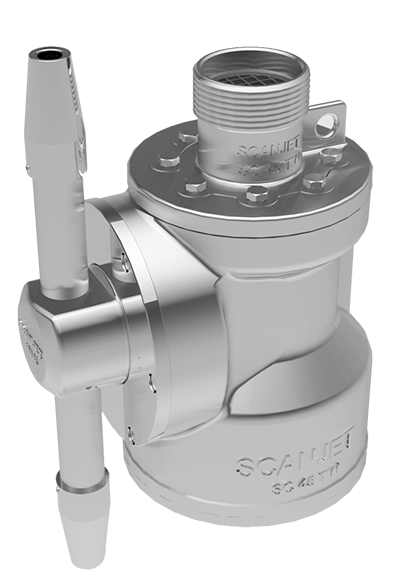 The SC 45TW is a 2.00 inch (50.8 mm) dual nozzle automated tank cleaning machine constructed of 316L stainless steel and other highly corrosion resistant materials. The SC 45TW has a fixed to moving gear ratio of 47 to 49 allowing it to produce a homogenous 360° spray pattern that is superior to that of any other rotating jet head in its class. The SC 45TW is classed as a rotating jet-head with an integrated turbine drive and employs an adjustable turbine and flow through gearbox. The adjustable turbine allows the rotation speed of the SC 45TW to be adjusted without the need of changing costly stators and/or gearing found in other similar cleaning devices in its class.